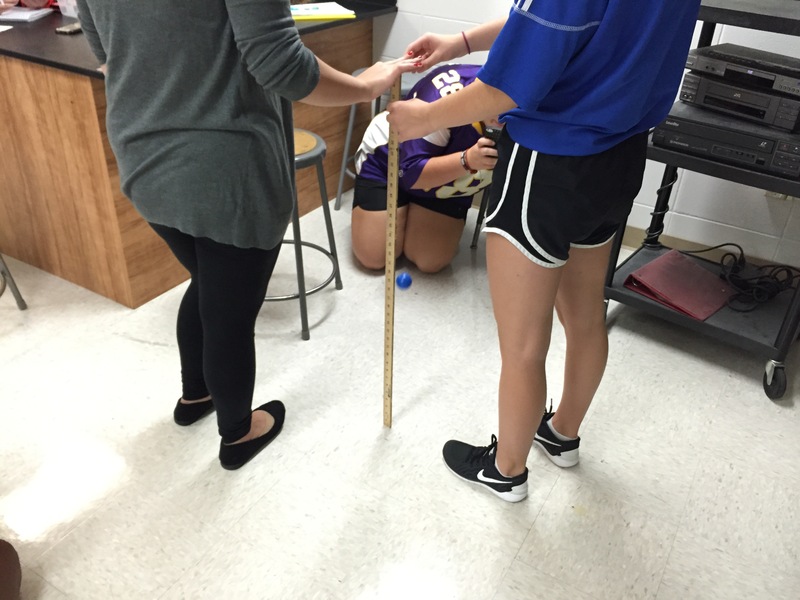 Students measured the rebound height of bouncy balls, ping pong balls, golf balls, and whatever else the science department had around and used conservation of energy to describe their behavior. Students started to really dig into velocity vs. time graphs today using a worksheet from the Modeling Instruction materials. Once they finished, they prepared whiteboards for Kelly O’Shea’s mistakes game. Tomorrow, students will present and discuss their whiteboards. Looking over the whiteboards, it looks like my students came up with some mistakes that will lead to nice discussion. I’m also really excited to get to the significance of the area under a velocity vs. time graph. During the Dueling Buggies practical, some of my students were really intrigued by the variety of possible solutions and really studied a bunch of other groups’ whiteboards. They realized that the one representation of constant velocity we’ve used that did not appear on any whiteboard was the velocity vs. time graph. This lead a group of students to try to figure out how they could use the velocity vs. time graph to find when the buggies would collide. I think after we go over the problems tomorrow, they’ll be ready to try it!